The largest city in South America, São Paulo sits on the Piratininga plateau and is surrounded by rivers that fan out into the interior. Almost from its founding in 1554, São Paulo became the gateway to the sertão (Brazil's backcountry), and explorers known as bandeirantes made expeditions from the city into this region. Today's main highways to interior cities still follow the routes of the bandeirantes. Immigrants from all over the world have always been a part of São Paulo, and you'll still see the influence of Portuguese, Spanish, German, African, Jewish, Arab, and Japanese residents on its life and culture. There is an entire museum devoted to Japanese immigration, for example, and another to the contributions of Africans in Brazil. Perhaps the most difficult thing to grasp about the city is its sheer size. A good way to get an idea of how far it spreads is from the observation deck of the 46-story Itália Building on Avenida Ipiranga. Many of São Paulo's tourist attractions are widespread, so you'll find the Metro a good way to travel between them. The São Paulo Museum of Art, known locally as MASP, only opened in 1968 but has the most representative and comprehensive collection of western art in Latin America. You'll see works by Impressionists and modern masters - Renoir, Van Gogh, Matisse, Manet, Debret, Picasso, Miró, along with 73 works of bronze sculpture by Degas alone. Although it reaches back to the Renaissance artists, this is one of the first art museums on the continent to focus on artists of the mid-20th century and later, as well as on contemporary artists in Brazil, including Portinari and Di Cavalcanti. Its outstanding collections put it in the league with the Tate Modern, MoMA, and the Centre Pompidou. The building itself, designed by Brazilian-Italian architect Lina Bo Bardi, is a classic of Modernism. The plaza under its suspended structure hosts a Sunday antiques market and frequent concerts. Architect Ramos de Azevedo modeled São Paulo's Municipal Theater after the Paris Opéra, drawing on an eclectic mixture of Art Nouveau and Italian Renaissance themes. Almost immediately after its completion in 1911, it became a major city attraction. This status was enhanced in 1922, when it was the venue for a landmark event that revolutionized the arts in Brazil. The Week of Modern Art introduced and spotlighted artists who were to become icons of the Brazilian Modernist Movement, celebrated names including painters Emiliano Di Cavalcanti, Tarsila do Amaral, Anita Malfatti, and Menotti Del Picchia; composer Heitor Villa-Lobos; playwright Mário de Andrade; and sculptor Victor Brecheret. A major center for the performing arts in South America, the theater has hosted performances by internationally renowned singers, dancers, musicians, and performing artists that have included Carla Fracci, Rudolf Nureyev, Titta Ruffo, Enrico Caruso, Maria Callas, Arturo Toscanini, Heitor Villa-Lobos, and Mikhail Baryshnikov. The building was completely restored to its original grandeur and re-opened in 1991. It is home to the São Paulo Symphony Orchestra, the Coral Lírico (Lyric Choir), and the City Ballet of São Paulo. 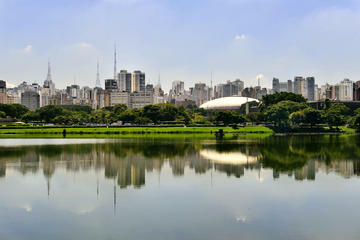 Ibirapuera Park was laid out by landscape architect Roberto Burle Marx, with buildings designed by Oscar Niemeyer. The immense green space with its monuments, museums, playgrounds, gardens, trails, lakes, and performance spaces is a leisure paradise for the people of São Paulo, as well as a showcase of modern architecture and culture. Commemorating the pioneers from São Paulo who opened up Brazil's interior, the Bandeiras Monument is a magnificent work by Brazilian sculptor Victor Brecheret, with imposing heroic figures. An obelisk commemorates those who died in 1932 in the struggle for a new constitution. Auditório Ibirapuera, the ultra-modern music hall designed by Oscar Niemeyer, is considered one of São Paulo's best concert venues. Museu da Aeronáutica e do Folclore, the Aeronautics and Folk Art Museum, displays aircraft models and flight equipment on the ground floor, with nearly 20,000 exhibits devoted to folk art and traditions from all over Brazil filling the remaining floors. The large Museu Afro-Brasil celebrates the contributions of Afro-Brazilians and their social and cultural history. Inside Parque Ibirapuera, the Pavilhão da Bienal de Artes, designed by Oscar Niemeyer and completed in 1957, houses the excellent Museum of Contemporary Art along with special exhibitions and shows. The museum's more than 8,000 pieces represent a wide range of art schools, from Picasso, Modigliani, and Léger to leading Brazilian painters Tarsila do Amaral, Anita Malfatti, Portinari, and Di Cavalcanti. Among Latin America's largest collections of 20th-century Western art, the museum also displays works by Marc Chagall, Wassily Kandinsky, and Joan Miró. The Sculpture Garden was designed by Roberto Burle Marx and displays 30 large works in an outdoor setting. In São Paulo's Ipiranga district, traversed by the stream alongside which the independence of Brazil was proclaimed by Prince Pedro, Independence Park commemorates that 1822 event. Overlooking the formal gardens of roses, topiaries, and fountains inspired by those at Versailles, is the Museu Paulista, more commonly known as the Museu do Ipiranga. Its Italian architect, Tommaso Gaudenzio Bezzi, created an eclectic design modeled on Italian Neoclassicism, reminiscent of Renaissance palaces. Inside are large collections of costumes, decorative arts, paintings, and furniture of the Imperial Period. The neo-Gothic cathedral was built on the site of an earlier cathedral and took from 1913 to 1967 to complete. Its building was interrupted by two world wars, which made it difficult to get the mosaics and other decorative elements from Italy. It was consecrated in 1954, on the 400th anniversary of the foundation of São Paulo. On the façade are statues of Old Testament prophets and Christ's disciples. Although the rest of the church is neo-Gothic, it is capped by a Renaissance-style dome. The interior has several interesting features, including the 10,000-pipe organ and stained glass windows picturing the history of Catholicism in Brazil. Be sure to notice the capitals on the columns, carved to represent Brazilian flora (branches of coffee and pineapples) and fauna, including armadillos. You can tour the crypt below the main church to see marble sculptures and tombs. The cathedral sits at the historic center of São Paulo, and is a good place to begin a walking tour of the old town. The square known as Pátio do Colégio, immediately north of Praça da Sé and the cathedral, is the original nucleus of São Paulo. Here, Manuel de Nóbrega and José de Anchieta founded the College of the Society of Jesus, a residence and center of study for Jesuits, and here on January 25, 1554, the first mass in the settlement was celebrated. 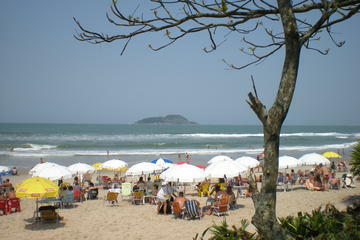 The attractive plaza is now occupied by the Historical Museum, a museum of sacred art, and the Capela de Anchieta. All that remains of the 16th-century building are the doors and a stretch of clay wall. In the gardens of the museum is a pleasant café. The Benedictine monastery and its church were founded in the late 16th century, but the current church dates only from 1910-22. Don't discount it for its modern origin or its rather austere exterior, as the interior is richly painted and includes 17th-century statues of St. Benedict and St. Scholastica carved by Agostinho de Jesus. A number of other notable Benedictine artists contributed to the decoration of the monastery. Also notable are some impressive stained glass, an image of the Virgin in a robe set with pearls, and a crucifix dating to 1777. This is an active brotherhood, and the monks accompany the morning mass with Gregorian chants. Stop in the monastery shop to buy cakes, breads, and chocolates made by the brothers. This museum is the oldest in São Paulo, opened in 1905 to showcase the works of Brazilian artists. Its 10,000 works of art include drawings, paintings, and sculpture from the 1800s through the present. Housed in the restored Liceu de Artes e Ofícios building, the architecture itself is a reason to visit. Part of the collection is housed in the museum's second location at Pina Estação where visitors will find a memorial to the São Paulo Resistance, an extensive library of historic documents related to Brazil's political struggles, and many more examples of Brazilian art. On Avenida Tiradentes, which skirts the Parque da Luz, are the convent and church of Nossa Senhora da Luz, typical examples of the traditional architecture of São Paulo: in spite of their fairly recent age - they were built in the 18th century - they are constructed entirely of clay. The Nossa Senhora da Luz convent now houses a Museum of Sacred Art, which has a large collection of about 11,000 items, including statues, pictures, altarpieces, and furniture from the 16th through 19th centuries. Also on Praça Tiradentes is the Pinacoteca do Estado, the State Picture Gallery, the oldest museum in São Paulo. It contains about 2,500 pictures, drawings, and prints, mainly by Brazilian artists. To the west of the cathedral and the Pátio do Colégio, Largo de São Francisco is a street in the city center named for the monastic complex that faces it. The Igreja de São Francisco de Assis, the church of St. Francis, was built in 1644 and is one of the city's oldest surviving churches. Its interior is clearly based on those of Portugal in that period, with a cheerful, airy feel and plentiful gold flourishes. It was restored after a fire in 1870 and again more recently. Not so the neighboring church of the Ordem Terceira de São Francisco, the Third (lay) Franciscan Order, built from 1676 to 1791 and so seriously showing its age that it is closed to visitors. The third building in the complex, the Franciscan friary, has been occupied since 1828 by the Law Faculty of São Paulo University. The neighborhood is a little run down and is not a place to visit at night. Avenida Paulista is São Paulo's center of activity, full of things to do and a favorite destination for both tourists and locals. This is an ideal spot for people-watching from one of the numerous sidewalk cafes. The area is home to many shops, theaters, galleries, and museums, including the São Paulo Museum of Art (MASP). There are also several adjacent parks, like Parque Trianon, which provides a foliage-dense oasis right in the city center. This main avenue hosts numerous festivals and celebrations throughout the year, often closing to traffic to become a pedestrian mall. Luxury Hotels: Several top-rated hotels in the Paulista area surround the São Paulo Museum of Art, close to restaurants and shopping. Renaissance Sao Paulo Hotel has a pool and good city views from the upper floors, while InterContinental Sao Paulo offers a large fitness center along with a pool. Some rooms have balconies. At the edge of Paulista, a few blocks from Ibirapuera Park, Marriott Executive Apartments also has several good restaurants within walking distance. Mid-Range Hotels: Close to the Trianon metro station and Museum of Art, the quiet Royal Jardins Hotel is near the public gardens. Spacious rooms and free breakfast make the nearby Golden Tulip Belas Artes popular. Still in Paulista, but only a short walk to Ibirapuera Park and its museums, Mercure SP Ginasio Ibirapuera has a pool. Budget Hotels: Although it is right in the center of the busy Paulista shopping and restaurant neighborhood, rooms are quiet at Ibis Paulista. 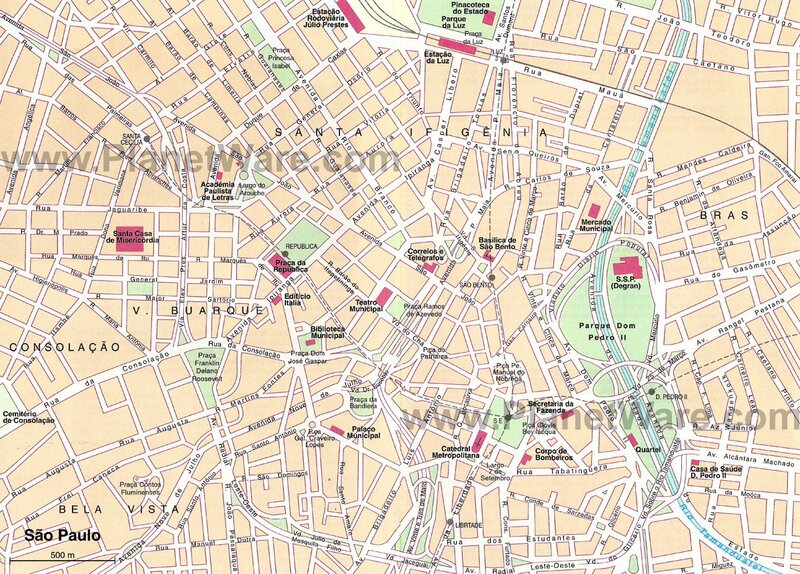 Melia Paulista is directly across from the Trianon metro station, and the airport bus stop is a block away. Also near the art museum, shopping center, and dining, Tryp Paulista has a sauna, fitness room, and small pool. Sightseeing Tours: Visitors can see many of the top tourist attractions on the three-hour City Tour of São Paulo, which begins at the Pacaembu Football Stadium and includes tours of several significant neighborhoods. Highlights include the Museu de Arte (MASP) in the Paulista neighborhood and the Municipal Theater and Pátio do Colégio in downtown São Paulo. The tour also visits Sé Square and its historic cathedral, as well as several public squares and historic monuments, including the stunning Ibirapuera Park.